Debra Young Nakamarra was born in 1964. She is the daughter of famous western desert artists Walangkura Napanangka and Johnny Yungut Tjupurrula who both have been represented successfully by the Papunya Tula Artists collective in central Australia. Debra started painting in 1984 after learning her own Dreamtime stories. 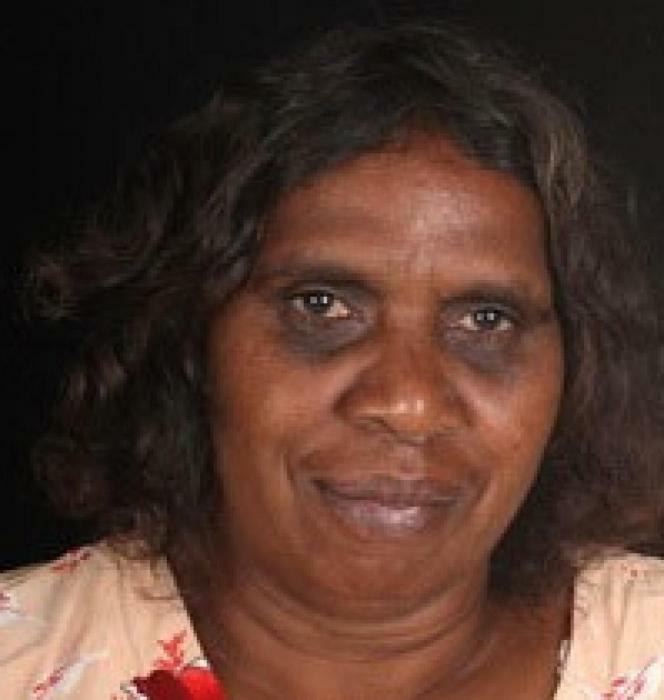 She also frequently paints with her sisters Lorraine Yungut Nakamarra and Katherine Marshall Nakamarra. Today she is an emerging artist, represented by Papunya Tula Artists. Her works are bold, strong and culturally significant. Most of her Dreamings are associated with Tjintjintjin, a cave site to the West of Kintore. The roundels and lines in her work depict the area through which an old Dreamtime woman, known as Kutungka Napanangka, passed during her travels. At this site, Kutungka knew of an ancestral Kuniya (snake) that lived underground. She dug a hole, found the snake and killed it. She then cooked and ate it, before continuing her travels east to Muruntji. Here she was accosted by one member of a group of boys. whom she chased and caught all but the culprit, who escaped. She killed the others and cooked them in a fire before travelling to Kaltarra, where she entered the earth.